These drawer/shelf liners are a piece of cardboard in a fabric pocket. The cardboard is removable so the cover can be washed. 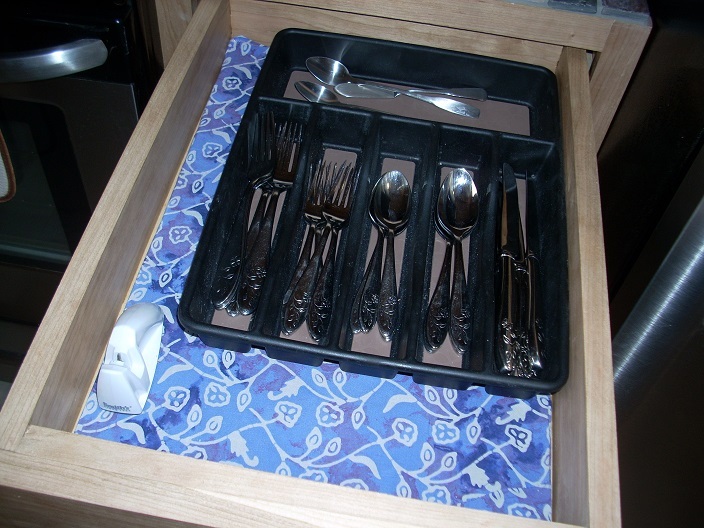 Gives a beautiful, clean look and protects the drawer/shelf. I sometimes use fabric from old clothes for the covers. Cut up boxes from your Amazon purchases (or wherever) for the cardboard. 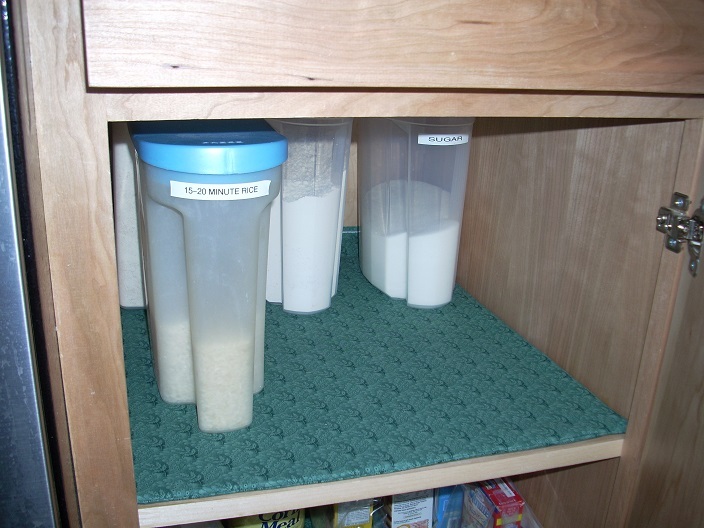 Measure the inside dimensions of the drawer/shelf. Check the piece in your drawer/shelfat this point, it should be a very tight fit. Trim 1/4" from the length and from the width, to make the fit looser and provide room for the fabric seams. This cardboard is used in the next step as a template to cut the fabric. WIDTH: each 1.5" wider than the side-to-side measurement of the cardboard. This allows for two side seams, plus a little extra for ease in inserting the cardboard. LENGTH: each 1-5/8" longer than the front-to-back measurement of the cardboard. This allows for a front seam, a finished back seam, and a little extra. I just lay the cardboard on the fabric and use the markings on my cutting ruler to give the needed extra length/width. Put cover pieces right sides together. Then, sew a 5/8" front seam. Sew 1/4" on back edge, then fold and zig-zag 3/8" again. This gives a finished edge for the opening where the cardboard is inserted (which is the back of the drawer/shelf). Turn right-side out, pushing corners out with (say) the eraser end of a pencil. Depending on the material used, the stiffness of the cardboard, and how tight a fit you achieved, you may or may not need this step. Cut two 1" pieces of sewable velcrothe hard side. Sew to edge of outside of bottom opening, at about 1/3 and 2/3 of width. Cut two 1.5" pieces of sewable velcrothe fuzzy side. Sew short edge to inside of top opening (about 1/4" overlap). Make sure it is centered on the hard velcro when folded over.